BAM! Have you ever had a bird hit one of your windows? Nearly a billion birds collide with windows each year, half of which happen with home windows. Unfortunately, the majority of birds die as a result of their injuries; even those that may be able to fly away often sustain life-threatening injuries. The good news is that window collisions are easy to reduce at many houses. 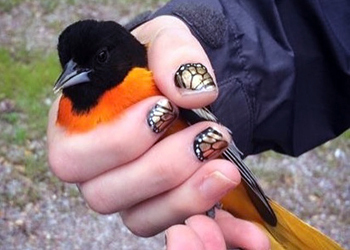 Birds can collide with glass both during the day and night. Daytime collisions generally occur because the birds see reflections of vegetation in the glass, or the glass appears to be transparent. Birds can also hit windows near feeders if a predator suddenly appears, so it is best to keep feeders close (within 3 feet of a window) or far (more than 30 feet from a window). Occasionally in the spring, birds will also see their reflection in the glass and attack it, also causing collisions. The reasons for nighttime collisions aren’t fully understood, but many nocturnal migrants navigate using stars and the moon. So, those animals may be lured to your windows due to lighting that mimics their natural guides. Not all windows are equally dangerous to birds, so the first step in deciding what to do is to inventory your windows. Windows that have screens on the outside generally will be avoided, but large windows that reflect vegetation and/or the sky are usually the riskiest for local and migrating birds. Windows close to trees or shrubs sometimes can be an issue as well. Generally, it is best to treat these windows first. Zen Curtains: Zen curtains, also known as Acopian bird-savers, are one of the cheapest ways to create bird-safe glass. The concept employs Para cord strung at 3.5 to 4-inch intervals along a PVC pipe or board placed above the window. The Para cord can either freely hang at the bottom, or you can secure it to another board or pipe. More detailed instructions and prefabricated bird-savers can be found here. Add Screen or Netting: Attach screen or netting at least 2-3 inches from the window. Make sure the area is taut to allow any birds that run into the mesh to bounce off. 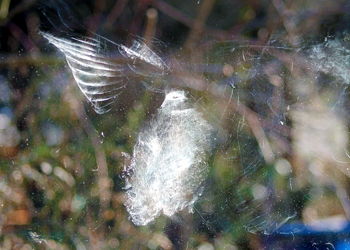 Add a Window Design: Decals or drawing on windows with glass paint or chalk pens can help decrease bird strikes. However, to be the most effective, the decals or the design have to cover the majority of the window. The best designs incorporate the 2×4 rule where the design is spaced out every 2 inches high and 4 inches wide, which is the size of the space most birds will avoid flying through. Note: While drawing with highlighters is effective for a while, by 3-4 days, the pigment is usually unnoticeable to birds. Add Tape: Several companies manufacture tape that can be applied to windows in strips or in squares. Some manufacturers, like American Birding Conservancy, make translucent tape that birds can see, but the tape isn’t as apparent to humans. Be sure to pay attention to application guidelines and how long the tape can last outdoors. Check for visible injuries like blood or a broken wing. If a bird has an apparent injury, then it is best to take it to a licensed wildlife rehabilitator. If the bird just appears to be stunned, grab a shoebox or another dark container with a lid. Gently place the bird inside and place the box in a quiet, dark area safe from pets and predators. Do not give the bird food or water, and keep the noise and handling to a minimum to reduce stress. Allow the bird at least 30 minutes to recuperate. Take the box outside close to the area where the bird was found and slowly open the lid. If the bird flies off, then that’s great! If not, then give the bird another hour of rest before trying again. If the bird is still unable to fly within three hours or flies but easily becomes grounded, then place the bird back in the box and call a licensed wildlife rehabilitator. 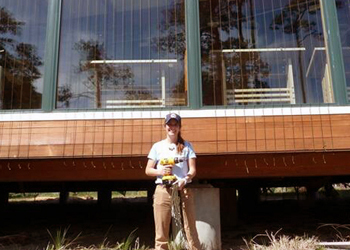 Note: It is illegal to care for a migratory bird without a permit, and rehabilitators are highly trained individuals. Spring has finally sprung! After a seemingly endless winter, I am excited to welcome warmer temperatures, spring flowers and wildlife into my backyard. This issue includes information on spring visitors like flower flies—a pollinator and a predator—as well as a beautiful native groundcover, moss phlox. In addition, spring is a time for migration, which can be hazardous for many birds. Check out our article on bird-safe windows for tips on how to make your home more bird-friendly as well as some recommendations by guest author, Clare Walker, on plants that help pollinators but often deter deer. If there is a particular topic that you would like to include, please don’t hesitate to reach out.